Trade diversion occurs when tariff agreements cause imports to shift from low-cost countries to higher cost countries. Trade diversion is considered undesirable because it concentrates production in countries with a higher opportunity cost and lower comparative advantage. Trade diversion may occur when a country joins a free trade area with a common external tariff. Suppose the UK place a tariff on the import of cauliflowers to all countries equally. There is an equal tariff to European countries and equal tariff to Australia. In this case, the UK will import from Australia at a price of P1. This is the lowest cost country in terms of producing cauliflowers. After joining the customs union, the UK abolishes tariffs with EU, but not Australia. The price of importing cauliflower from the EU falls to P2. In this case area, 5 is greater than 2+4. 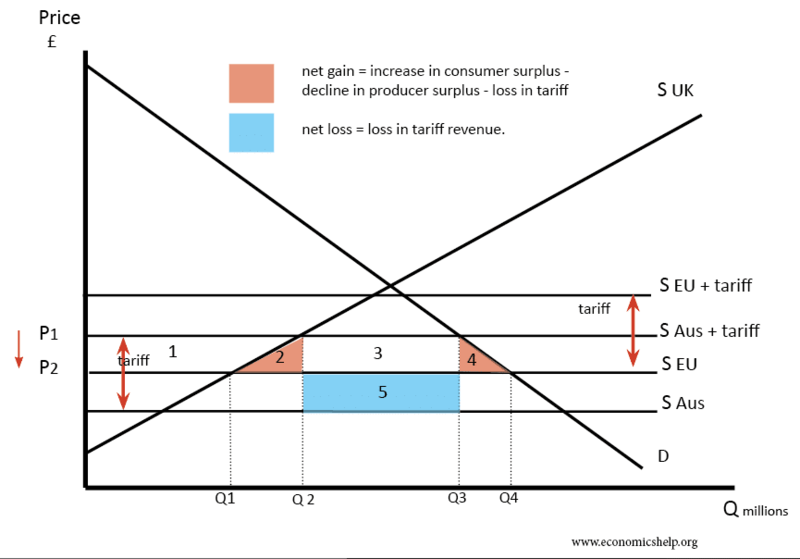 So there is a net welfare loss to the UK – even though consumers benefit from lower prices. It is possible area 2+4 can be greater than 5 – depending on the elasticity of demand. Australian farmers lose out. Exports fall. The global economy loses out because we have shifted from low-cost producers – Australia – to relatively high-cost producers the EU. The above analysis suggests the UK had equal tariffs to all countries, such as Australia. However, before joining the EEC, the UK had free trade agreements with countries in the Commonwealth, such as New Zealand and Australia. When the UK joined the EEC, it had to implement an EEC wide common external tariff of imports from outside the EU. The effect was to make Australian and NZ agriculture more expensive than previously. Therefore we switched imports from New Zealand to European countries. Prices rose for consumers for items like butter. 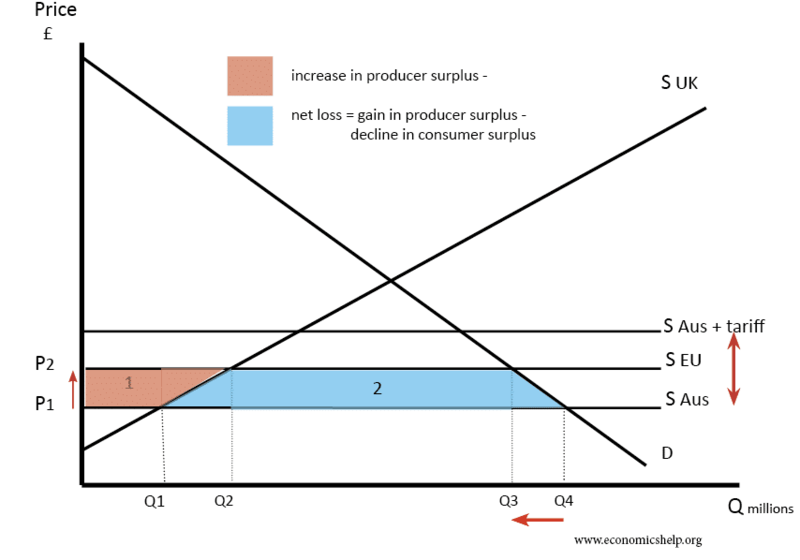 Consumers tend to lose out because they pay higher prices from the less efficient producer. By joining the EEC, the UK gained from new free trade agreements within Europe. The big losers were New Zealand and Australia who lost trade to the UK.